We’d love your help. Let us know what’s wrong with this preview of Over The Garden Wall by Pat McHale. Based on a Emmy Award-winning Cartoon Network miniseries, Wirt and Greg are brothers, lost in a strange and endless wood called the Unknown. To find their way home, they must make it through this eerie place, where their only guides are a sardonic bluebird named Beatrice, and an elderly Woodsman. But as things become stranger and stranger, can they find their way out...ali Based on a Emmy Award-winning Cartoon Network miniseries, Wirt and Greg are brothers, lost in a strange and endless wood called the Unknown. To find their way home, they must make it through this eerie place, where their only guides are a sardonic bluebird named Beatrice, and an elderly Woodsman. But as things become stranger and stranger, can they find their way out...alive? To ask other readers questions about Over The Garden Wall, please sign up. 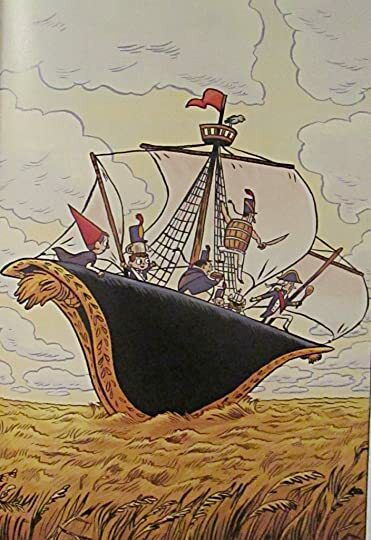 And so off we sailed with the soldiers; my brother, my keeper, and I...into the fields of the Unknown upon an unscientific-looking sailing hat that made no sense at all. and so grateful to connor for tracking this book down for me - how this went out of print so quickly and how every existing copy managed to fall into the hands of the greediest, grubbiest used book vendors in the world is beyond me. not one reasonable price in the lot of ‘em. back to the book - it’s great. the art, the stories, the sheet music at the end, and the cover gallery featuring no fewer than FOUR by jordan crane - it's just all-around wonderful. i'll check out those other comics, but it's gonna be hard to top this. 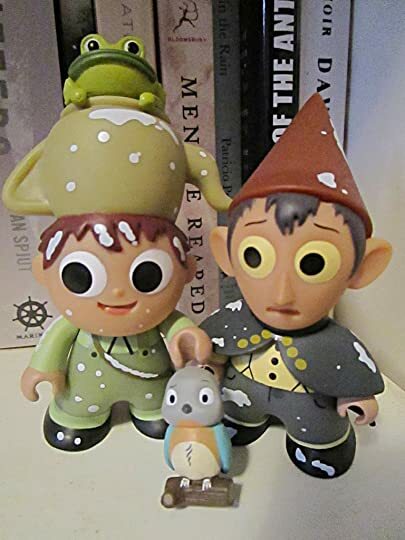 erica/connor, i cover you with gratitude the way those greg and wirt figurines are covered in ... snow. I ADORED this. 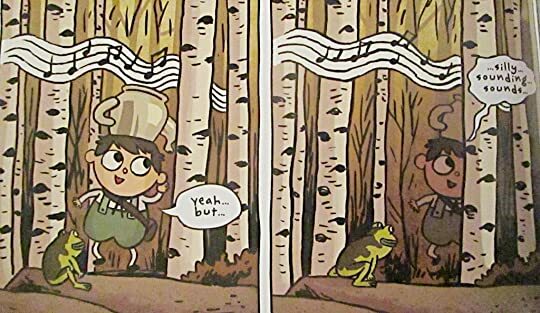 Over the Garden Wall is one of my favorite works of animation EVER, and this comic did not disappoint. It carried the same feel of the series, so it felt like getting bonus episodes. And seriously, if you haven't seen the series yet, please do so, it's amazing! First things first. If you haven't seen ALL of the TV series "Over the Garden Wall", go watch them before picking up this collection. There are spoilers in these here comics. That, and jokes and references you might not get unless you know what's going on in the Unknown. Anyway, for those who have seen the series, this is a nice little addition to the Over the Garden Wall story. Each one focuses on the adventures of Wirt, Greg, Beatrice, and Greg's pet frog that happen in between the episodes fro First things first. If you haven't seen ALL of the TV series "Over the Garden Wall", go watch them before picking up this collection. There are spoilers in these here comics. That, and jokes and references you might not get unless you know what's going on in the Unknown. Anyway, for those who have seen the series, this is a nice little addition to the Over the Garden Wall story. 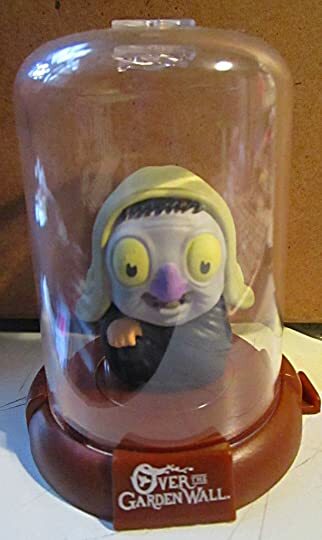 Each one focuses on the adventures of Wirt, Greg, Beatrice, and Greg's pet frog that happen in between the episodes from the series. Each one has a definite place in the time line of the series, and while I don't think seeing the TV series is a requirement for reading the comics, you'll definitely miss things and spoil some of the best "OMG" moments from the show. Especially with the last story, which talks about the backstory for the Woodcutter you meet in episode one. At the end of all this is a collection of sheet music. It contains some songs from the series (though not my favorite, "Mashed Potatoes and Molasses") as well as a song that's featured in the comic (so you'll now know what it really sounds like). Maybe I just don't get the humor in this tale because I've never watched the show, but it's very weird and not all that entertaining. I have started to read this book several times, thinking it would be a fun fast read, but the challenging font, odd dialogue, and hard-to-follow plot led me to stop after only a few pages every time. It wasn't until I had a long wait at the ER with my mom that I finally got around to finishing it. Really 3.5 stars. Without the whimsical music that made the show so magical, this addition struggled to capture the real joy of the original miniseries. (I also dislike reviews that compare books with their show equivalent, but in this case the show came first so I'm allowed...) It was certainly charming, and if you are a fan of the show this does a good job as filler for what the characters were doing between episodes. Good romp, fun times, more teapots. LOVELY. A cute addendum to a really fabulous show, which I love to pieces. 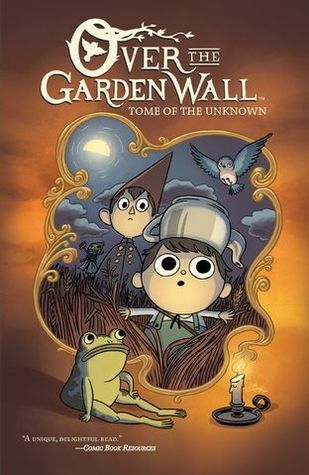 I also much appreciate that these are further adventures (some of which fit in-between episodes) as opposed to any kind of sequel, because Over the Garden Wall is perfect as it is and needs no sequels. Also I enjoyed that I could hear the voice actors in my head as I read the dialogue. Highly recommended for fans of the show. This was ADORABLE and CREEPY and I need more, so I'm going to watch this mini-series I knew absolutely nothing about until now. The art is of course fantastic. The show is great. This was just kind of ok for me though. I do like how the music is in the back. Lies sometimes make friendships and adventures more interesting. 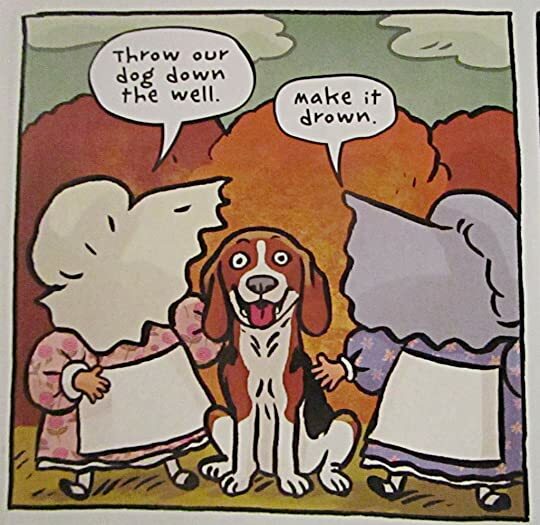 This graphic novel mixes jocularity with morality tales, sometimes feeling a little Grimm; the next moment, a little Tweedle Dee and Tweedle Dum. The art is simple, yet comfortable. At first, I thought the boxes were over-run with text, but then I remembered some of Richard Sala's panels, and checked my opinion. This extremely cute graphic novel is definitely for fans of whimsy, cartoons, and bumbling sidekicks. Beautiful artwork in this book but I really had a hard time following what was going on. I felt it was bogged down with so much chattery inane dialogue and exposition and this might the be tone of television cartoon but this is squarely in the 'not for me' camp. As well, my confusion makes sense after discovering that this isn't really a complete story - it fills in the gaps of the cartoon series so pretty much if you haven't seen the show, you're going to be equally confused. The 10 part cartoon miniseries Over The Garden Wall is a work of genius, as far as I'm concerned, a nigh on perfect piece of art in terms of all the things that count - music, characterisation, artwork, atmosphere... I LOVE IT. I went book shopping last week at Waterstones in Regent St. with a friend. It's a swell thing to do - get to the top floor bar in time for happy hour, have a coupla strong cocktails fast, and then spend hours browsing and choosing books. I made it a rule that I couldn't b The 10 part cartoon miniseries Over The Garden Wall is a work of genius, as far as I'm concerned, a nigh on perfect piece of art in terms of all the things that count - music, characterisation, artwork, atmosphere... I LOVE IT. I made it a rule that I couldn't buy even numbers of books, so came away with five, and this one was the last I chose. I was expecting the miniseries in still art form, but it's not that at all - instead, it's a companion piece, with many of the episodes in the book ending where an episode of the series begins. For a fan, it's really satisfying to be able to put the two together. The main characters - Greg, Wirt and Beatrice - are exactly who they are in the miniseries and the host of minor and new characters the same weird, tragic, unnerving and cute as you'd expect. This volume of 5 comics fills in the gaps of the animated miniseries, Over the Garden Wall, and it's written by the series creator. They're great. They fit right in with the episodes, and the way they connect really interesting. 1. 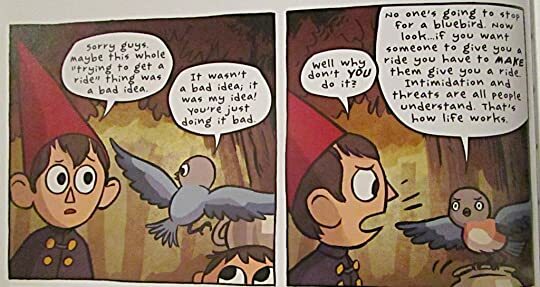 "Four Wayward Soldiers": this one's fun and creative (like all the rest), but the best thing about Issue #1 is the way it goes inside Wirt's head. 2. "Don't Tell Papa" is the funniest one of the bunch. 3. 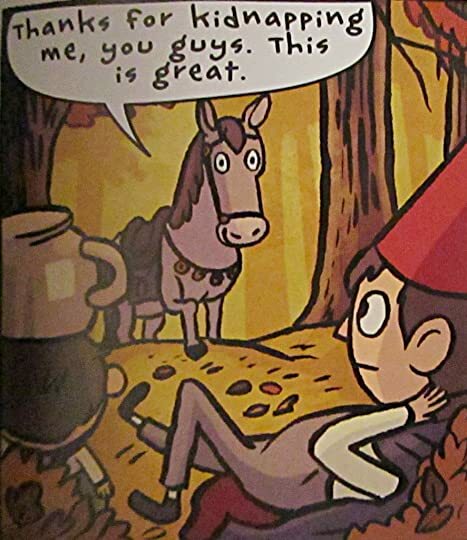 "The Tale of Fred the Horse" tells the backstory of Fred, and it's This volume of 5 comics fills in the gaps of the animated miniseries, Over the Garden Wall, and it's written by the series creator. They're great. They fit right in with the episodes, and the way they connect really interesting. 3. "The Tale of Fred the Horse" tells the backstory of Fred, and it's great. It really explains a lot (it would have made for an awesome episode). 4. "Round the Ol' Pear Tree" is pretty good in terms of character, but it kinda feels like a rejected episode idea that wasn't developed any further. 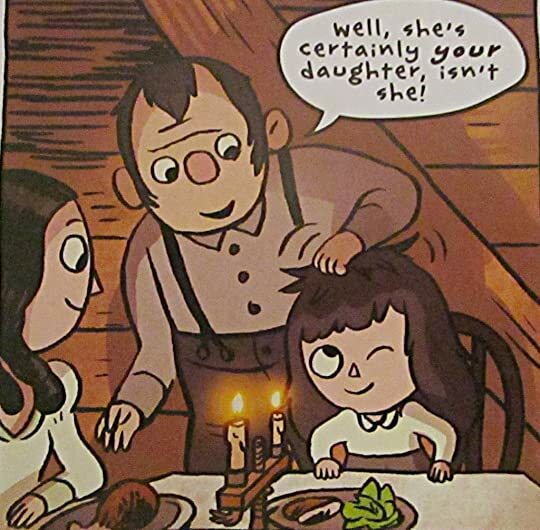 I love "Over the Garden Wall" and cannot wait to read the other graphic novels in the series. The graphic novels keep the same light-hearted comedy of the TV show. I really enjoyed reading the stories and highly recommend it to anyone. The graphic novel is also beautifully illustrated with some great bonuses at the end: scores for a few of the songs from the TV show and images of the covers of past graphic novels. An excellent addition to the tv series, it perfectly complements the show by telling stories that fill in gaps and add more to this fantastical world. Read on its own this would not make much sense, but together the two create a complete story. I especially loved the story of The Woodsman's Daughter, very well done! 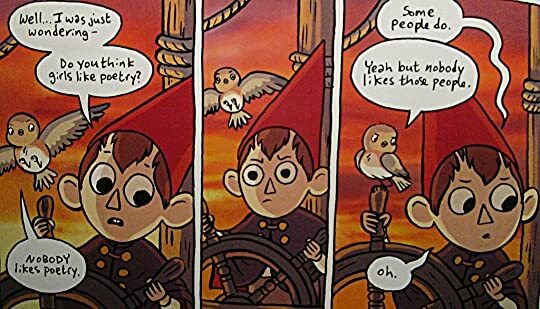 I love the Over the Garden Wall tv show and this collection of comics suits it so well (and often explains what happened between episodes). The artwork is beautiful and the voice of the show really shines through. I don't think people unfamiliar with the show would enjoy it, but fans of the show will love it! 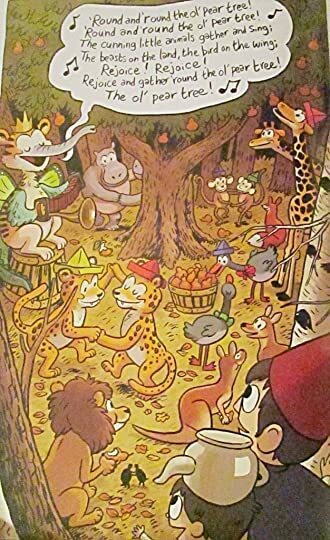 If, like myself, you are a huge fan of the TV mini-series, then this first comic volume of Over the Garden Wall is a must, as it perfectly captures the unique tone, humor, and strangeness, with a series of stories that work seamlessly with the episodes. Even more, it captures that gorgeous, autumn fantasy setting through which Greg and Wirt wander. What a wonderful little graphic series! I thought this graphic novel would follow the TV series, but it doesn't! [ I mean this in the best way :) ] This story expands upon the lore of the series and showcases new little adventure the boys went on while searching for Adelaide. this book was just like the show, witty, dark, hilarious, and freaking adorable! I loved all the new adventures and it made me want to watch the show again sooo badly 💙 would definitely add this one to my collection! 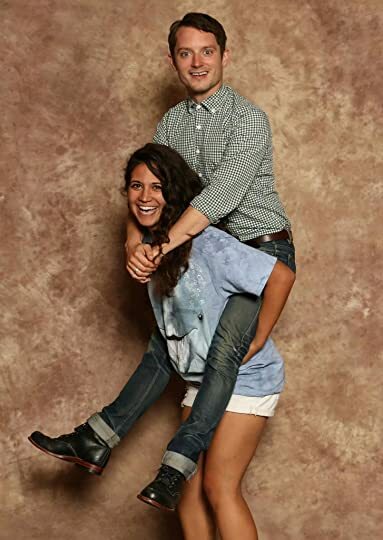 Patrick 'Pat' McHale is a writer, storyboard artist, animator, and independent filmmaker, best known for being a former writer and creative director on the animated series Adventure Time for Cartoon Network, which he contributed to during its first five seasons. McHale also created the mini-series Over the Garden Wall.